Addressing assembled staff and students at the Undergraduate Research Showcase event on Wednesday 20th November, the Vice-Chancellor likened the event to the Oscars ceremony … and, well, to continue the metaphor, Classics came away holding a golden statuette! 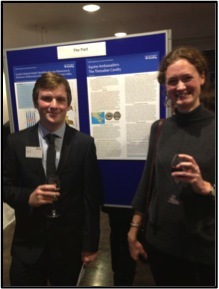 Josh Kerr and Emma Aston toasting his poster on the Thessalian cavalry in ancient warfare. At the event, every student who undertook a UROP (Undergraduate Research Opportunity Placement) in 2013 presented a poster on his/her research. Posters were grouped by category, and in the group labelled ‘The Past’, antiquity was strongly represented in the form of Classics Department students Abi cousins, Josh Kerr and Will Burks. Between them, their three projects covered a wide and fascinating range of ancient life and culture, showcasing the flexibility of the discipline. Will’s project involved collaboration with University Teaching Fellow Dr Matthew Nicholls on the ongoing development of the latter’s digital reconstruction of ancient Rome. Josh’s poster presented one aspect of his joint research with Dr Emma Aston on the role of the famous Thessalian horse in ancient society, and reflected his particular interest in military history and ambition to continue on to postgraduate study. 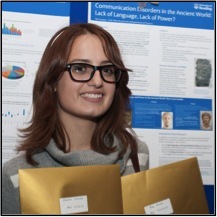 Abi Cousins had, with Professor Peter Kruschwitz, produced a ground-breaking study of speech-impediments in ancient culture, a neglected aspect of the ancient world with far-reaching implications for our understanding of language and communication. What all three had in common was the process of painstaking reconstruction: reconstruction of lost buildings, reconstruction of beliefs and of ways of life now imbued with that hair-raising mixture of strangeness and familiarity which makes the ancient world so unceasingly fascinating to all who work on it. For those of us who managed to tear ourselves away from ‘The Past’ (and it’s never easy), the other categories of research on display also provided interesting viewing, ranging from environmental science to cognitive processes in primary-school children. Deciding which projects should be judged best in their categories can’t have been easy, and the hard work of all participants was recognised in the presentation of certificates and VC handshakes. But when it came to the presentation of the awards, it was hard not to wait with baited breath. And Classics gained an amazing double prize: Abi Cousins received not only the award for the best project in her category, but also the prize for best project overall. Actually, there was no statuette … but she did receive golden envelopes (a classic HE equivalent, and very appropriate to these straitened times). Not to mention, to use Homer’s phrase, a hefty dose of κλέος ἄφθιτον (‘undying glory’)! This entry was posted in News and Events, Research, Students and tagged Dr. Emma Aston, Dr. Matthew Nicholls, Prof. Peter Kruschwitz, UROP. Bookmark the permalink.